Sony Mobile, together with Vodacom have announced an exciting Summer promotion. 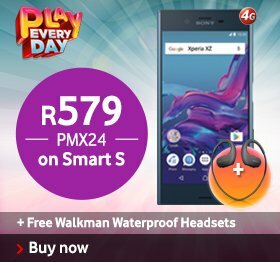 When purchasing or upgrading to the brand new Xperia XZ, XA or X Compact at Vodacom you will automatically receive a FREE Sony Walkman Waterproof Headset, Portable Bluetooth speaker or a Water Bottle Bluetooth speaker. When purchasing or upgrading to the 23MP rear camera and 13MP front facing camera Sony Xperia XZ you will automatically receive a FREE Sony Waterproof Walkman headset. The Sony headset is perfect for indoor and outdoor training, with an 8 hour battery life and 3 minute quick charge, you won’t be left sweating without a beat. Whether you’re in the pool, jogging or on a bike ride the 4GB headset will fit your active lifestyle perfectly. Also, purchase or upgrade to the Xperia XA at any Vodacom outlet and receive a FREE Portable Bluetooth speaker that has up to 10 hour battery life and is suitable to play anywhere, anytime. Sink your music from your phone and enjoy the refined sound with the super convenient Portable speaker this holiday season, the perfect travel companion. Last but not least purchase or upgrade to the Xperia X Compact and get your FREE Water Bottle with Bluetooth speaker. This handy Waterproof Portable Bluetooth speaker is perfect for any outdoor activity or when just hanging out with your friends this festive season. The 8 hour battery life will keep you in tune with the latest music while staying hydrated. Get the Xperia XZ Smartphone at a Vodacom store for R579 for 24 months on a Smart Small plan and get an additional 10GB data once-off. Purchase or upgrade to the Xperia XA for R299 on a uChooseflexi 200 plan and receive 5GB once-off data, lastly get the Xperia X Compact for R499 on a uChooseflexi 200 plan and receive an additional 10GB data once-off.